Do You Have a Gay Head? 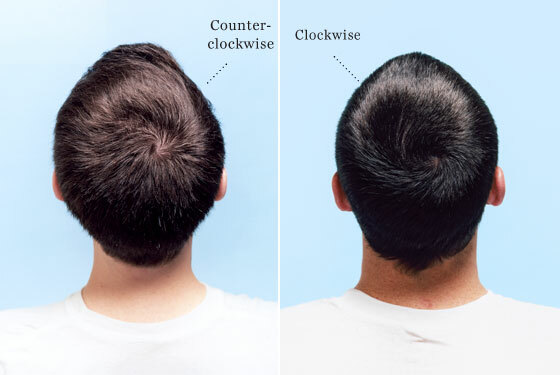 Gay men are more likely than straight men to have a counterclockwise whorl. Do you have a gay head?? Do the size of the fingers on your hand betray your sexual identity?? An article explores some recent studies into the biological traits of gender and sexual identity, highlighting some strange and surprising correlations between one’s physiology and sexual orientation. Here are large chunks of excerpts from the article. The article is quite long, but a very interesting read that should not be missed! Statistically, for instance, gay men and lesbians have about a 50 percent greater chance of being left-handed or ambidextrous than straight men or women. The relative lengths of our fingers offer another hint: The index fingers of most straight men are shorter than their ring fingers, while for most women they are closer in length, or even reversed in ratio. But some researchers have noted that gay men are likely to have finger-length ratios more in line with those of straight women, and a study of self-described “butch” lesbians showed significantly masculinized ratios. The same goes for the way we hear, the way we process spatial reasoning, and even the ring of our voices. One study, involving tape-recordings of gay and straight men, found that 75 percent of gay men sounded gay to a general audience. It’s unclear what the listeners responded to, whether there is a recognized gay “accent” or vocal quality. It was already known that in (presumably straight) men, a cell cluster in the hypothalamus called INAH3 is more than twice the size of the cluster in (presumably straight) women, a distinction probably created during fetal development when male hormones begin acting on boy fetuses and the two genders embark on different biological courses. LeVay designed a study to see if there were any size differences inside gay brains. His results were startling and unexpected. In gay men, INAH3 is similar in size to straight women’s. Sheep are among 500 animal species where homosexuality has been documented. They are also among the few who practice exclusive homosexuality, like many humans. In any population of sheep, about 8 percent of males show exclusive homosexual behavior. Little is known about the romantic life of Sapphic sheep because ewes tend to express their sexual interests by standing entirely still, yielding no clues about their partner preferences. Slicing open the brains of ten ewes, eight female-oriented rams, and nine males who preferred other rams, researchers in the Oregon Health and Science University School of Medicine found nearly the same variations in hypothalamus that LeVay first noticed. Male sheep who were attracted to females had a significantly larger hypothalamus dimension than females or male-oriented males. Of course, biology doesn’t determine everything. And some critics of sexual-orientation researchers blame them for minimizing the role of experience in determining our affectional course in life. The feminist biologist Anne Fausto-Sterling has waged a constant battle against their research, which she calls “a big house of cards” that ignores the power of environment in creating personality. Nurture, she argues, can and should be studied as a link to sexual orientation. I’ve always held that most (all?) people possess the genetic predisposition to various sexualities, but only a few people actually trigger the ones different from the norm. This trigger is quite possibly the result of environmental and developmental influences. I am not against parents genetically determining the sexuality of their children, if this ever becomes possible. Parents have that right, and governments need not interfere in this personal and familial matter. But I would highly discourage such a practice. A case can be made that the child’s right to be naturally who he is born to be is being violated by the parents interference. To that, I would like to point out that since sexuality is not wholly (or even largely) determined by genes alone, it is still quite possible for the child to develop a sexual identity that is different from or a combination of his existing genetic makeup–even though the likelihood of that happening may be very small. Thus, the child is not naturally born to be heterosexual or homosexual–only more likely to be so depending on its genetic makeup. Finally, regardless of whether sexual identity is biological or not (and to whatever extent), the morality of sexual identity is not essentially dependent on its physiological origins. All men are born with the capacity to reason; but this fact does not make all men rational or moral. This entry was posted on June 20, 2007 at 2:36 PM	and is filed under General Work/Life, Homosexuality, Love and Romance, Personal, Uncategorized. You can follow any responses to this entry through the RSS 2.0 feed. You can leave a response, or trackback from your own site. That reminds me. The “Pride” parade is coming up soon here…. I still have not attended one in all these years. Gays keeps saying, “Happy Pride!” as if it were a holiday or something. They’re so proud. I remember attending the parade only once–with Beno! hehehe.. 🙂 It was actually a lot of fun. I also remember drama queen MOISES sashing around the Roosevelt van! GAWD. Do you keep in touch with him? Ya know, if you were living in India… I bet you wouldn’t be complainin’ of all that damn proud gaybois saying “Happy Pride.” Indeed, my ears are longing to hear some high-pitched, tangy, distinctly gay voice saying Happy Pride to me. “Happy Pride” Jerr! In my shrillest, most gayest voice! LoL. Eeewww! From you, it’s gross! Reminds me of your “Indian chudail” laughter… aaarrrhhl! And Moises? LOL I haven’t seen that girl in years! I should look her up. Do YOU have a gay head Avadhut? Hmmm, must remember to examine the whorls on your head.